I love a bowl of warm, hearty porridge in the morning, but I prefer real grains like bulgur or steel cut oats and unless I am motivated to start cooking it the night before in my crockpot, I usually am not willing to wait 30 to 45 minutes for a bowl of porridge to cook. I recently received a copy of a new book called Quinoa Revolution written by Patricia Green and Carolyn Hemming, and after reading about their quinoa porridge that cooks in just over 15 minutes, I decided to give it a try. If you are not familiar with it, quinoa is an amazing ingredient, and is not a grain, but a seed, so is gluten free. It is also a complete protein containing all 8 essential amino acids, and is a good source of iron, phosphorous, magnesium, calcium, vitamin E, and folic acid so you can see why some consider it a superfood and why it is becoming more and more popular. 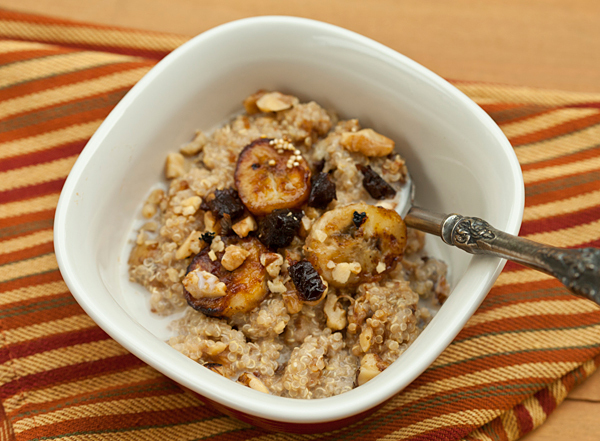 I made the Creamy Banana Breakfast Cereal from the book Quinoa Revolution with a few changes. I caramelized my bananas, added toasted chopped walnuts and finely diced prunes, used almond milk instead of regular, and did not process my cereal in the food processor as instructed as I prefer texture in my hot cereals. If you are not a fan of prunes, feel free to replace with raisins, or simply leave them out. Though you can skip the step to caramelize the bananas, they really do add a LOT of flavor when prepared this way. This cereal turned out so flavorful and was so easy to prepare, that I will be making it at least once a week in the future, and I am certainly now a convert for using quinoa in my morning porridge! 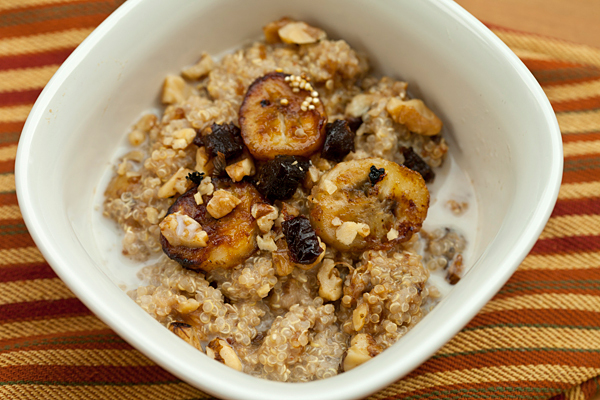 Caramelizing the bananas brings out their natural sugars so you do not need to add additional sweetener. Bring the 1 cup of almond milk and quinoa to a boil, then reduce the heat to a simmer and cook for about 16 to 17 minutes or until tender. While the quinoa is cooking, spray a frying pan with olive oil spray, toss the banana slices in the brown sugar and cook over medium heat for about 2 minutes on each side until lightly browned. Set aside a few slices of banana for the garnish and chop the rest. Add the chopped walnuts to the frying pan and cook, tossing often for 3 to 4 minutes over medium heat until toasted. 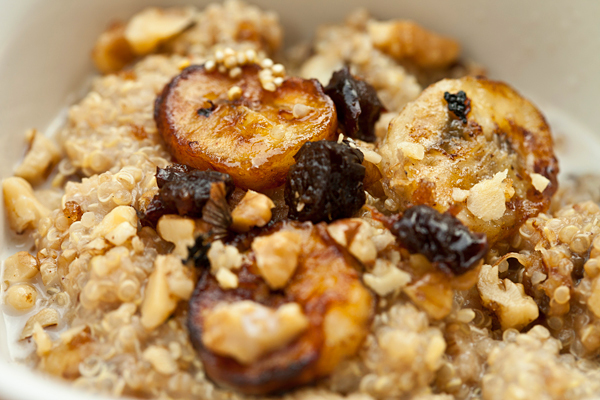 Add the rest of the almond milk to the cooked quinoa, along with the chopped banana, cinnamon, prunes, and walnuts. Serve immediately in two bowls, topping with reserved banana slices. This is what ive choosen for Thanksgiving, served with pumpkin ice cream! i cant wait lol!